I was really debating whether to post this picture or not. After all, these are really rather boring. Guess this is just to prove (to whom?) that I have been sewing, even if the results are rather boring. Two more pair of elastic waist pants in black Galaxy twill. Enough cotton to make them comfortable, and enough polyester to make them pretty well wash-and-wear. (Well, probably only because mother isn't around to scowl at wrinkly clothing.) The first pair I made back here. The only request after the first pair was to make the elastic tighter. (Good thing that I made notes when I sewed the first pair, because it's been a while.) And this time around I made a loop and button at the top of the zipper. Now that I look at the picture, I realize that this fabric, despite careful pressing, refuses to look pressed, so perhaps it's not even worth it getting an iron close to these. Soon enough I'm sure, these will be sporting lovely blobs of sauce of one kind or another and large grease spots - trademarks of the profession. Now I'm trying to finish off my daughter's somewhat belated birthday present before I can get back to my own sewing. And something tells me that I really should start thinking about Christmas presents, that is, if I'm crazy enough to be making things. I didn't think I would be able to, but I was lucky enough to go to the Creative Festival in Toronto on Friday. There was so much to see, so many lovely things to paw at - I didn't really have time to take it all in before our time was up and I had to go back to the bus. 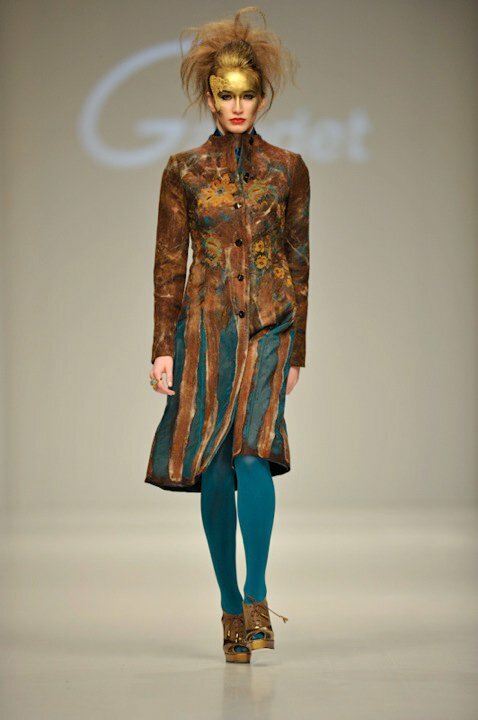 The one booth where I was really blown away, was Gaudet Fashion House. These two fellows make the most amazing felted coats. I just had to get back at the end of the day for a second look (and feel). These are the most amazing coats I have ever seen. Of course, there were workshops on this technique, which I was not lucky enough to get to. Who am I kidding - even if I knew how to create this felt, I would never get around to actually making enough fabric to create such a coat. Well, I can dream. 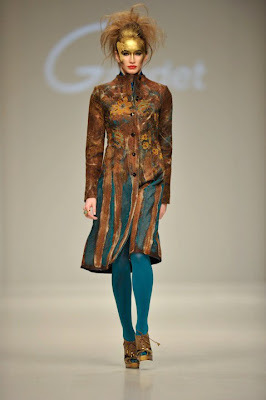 Notice - I don't dream of owning one of the coats created by someone else - I dream of being able to create such a coat. Is there something wrong with my thinking? Life would be so much easier if I didn't always think that I have to make everything I dream of. Of course I didn't leave empty handed. I finally have my very own Soho coat pattern from the Sewing Workshop Collection, which I've been "thinking about" for ages. (Even got to talk to Linda Lee - the designer!) What looks like black, is actually black and brown herringbone printed velveteen (so soft) and the other fabric is an absolutely luscious Italian wool for a pair of trousers. And that little bit in the front of the picture is a small piece of the softest black leather. I need a very small piece to patch my mother's gloves. (That was the "excuse" for buying the leather in the first place.) The rest will be - who knows - piping? binding? - well, some sort of accent on some sort of a jacket. I'm determined that it will not sit in a box for years before it gets put to use! Sorry - we're back to that time of year when outdoor photographs are next to impossible, so it will be back to figuring out something in terms of decent enough lighting to actually show things decently in pictures. This was just a quick shot on my cutting table, and obviously, though well enough lit for me to cut - not nearly well enough lit for a decent picture. I'll just keep on trying! Two more UFO's done and delivered. I made a jewelery case for my sister at some point, which was to be followed by two more - one for each of my nieces. They were cut, started (last year?) and then... Since my sister's family was arriving for the Thanksgiving week-end (that was last week-end around here), I thought it might be nice to finish these up to give to the girls while they were here (and save on postage). One was done well ahead of the week-end - the second one - well - let's just say that every morning I woke up, made coffee and headed to the sewing room to put in some time before the others were up. I did it - finished Monday morning to hand over a few hours later. Ugh - this looks skewed, because I probably had the camera tilted wrong. You get the picture - all sorts of pockets and gizmos to keep everything in place. May-be I should now finish up some of the current sewing - too much jumping around from one project to another. I have a dress "in process", a skirt started, a "raincoat" cut and a few things promised for my son and daughter that need to get done soon. May-be I need to ignore the planning of the fall and winter wardrobe and just buckle down to sewing. Here is the second rendition of the Cool Cardigans. The fabric has been "hanging around" for years, awaiting the perfect project. I obsessed about lining it, because it's quite sheer - very sheer black knit with these loopy threads pulled through it. Not terribly practical - very prone to pulling and probably pilling. Have no idea what the content is. Enough obsessing - it is now actually getting worn, instead of taking up shelf space. And no, I did not line it. What was I thinking? Oddly enough, it's even quite warm. I think I mentioned that I handled the back of the neck differently than the pattern instructs. the remains of the bamboo knit became a three-quarter sleeve t-shirt. The skirt is a piece of embroidered fake suede made into my standard straight skirt, lined. This is not the Magic Pencil skirt, because the fabric is not stretchy. Now what I really need to do, is tackle the organization of the winter wardrobe, instead of pulling things out of hiding piecemeal. I need to stop moaning about all the summer sewing that didn't happen, stop dreaming of all the "wouldn't I love this in my closet", and actually come up with some sort of plan for wearable (i.e. clothes that actually fit my life) outfits. Well, that and catching up with all sorts of UFO's and promises. There was a bit of a scramble at the beginning of September to get my class samples done and hung up in the store. My daughter was still here and she helped me pull out a number of items from my closet to be "pretend samples". A vest is a vest (students pick their own pattern anyway), pants are pants, etc. What I did have to actually sew were the items from Pamela's Patterns. It was all Jane's fault! I was admiring Jane's t-shirts and skirts and cardigans, and decided that these would make for wonderful classes, as well as a great way to promote the patterns. Not too eye-catching, I know. I remembered to snap the picture once I had the outfit hanging in the store. Can't even try to compete with the colourful quilts that are hanging behind. This trio is the Perfect T-shirt, the Magic Pencil Skirt and Cool Cardigans - Draped Front. The t-shirt happened way back last winter during a t-shirt marathon when I first got on the Pamela's Patterns bandwagon. The skirt took a little more than an hour from cut to finish. Mind you - I did not fit this skirt - just sewed. It's hanging on a dummy! I didn't have appropriate fabric and found something navy in the store basement. After a wash, it turned into "distressed navy" - for a casual(?) look. Hey - I was going for speed here - I was behind - very behind. The cardigan - now this I really didn't want to be parted with for the several months that it will be hanging in the store. The fabric is bamboo and spandex. It's what's being sold as "ribbing" to go with the bamboo knit for t-shirts, so it's much beefier than the regular bamboo knit, and I think, perfect for a cardigan. Sooooo soooooft! It was a pleasure to sew. Now, Pamela suggests gluing ( my term) the hems with Steam-a Seam. I didn't. (Notice - I don't follow instructions too well.) I simply pressed the hems, serged the edges for a neater look and straight-stitched all the way around. One thing that I'm not too crazy about is the elastic that scrunches the back of the neck to make the folds. For the sample I followed instructions for that, but for my second cardigan I simply made a pleat. (And that you will get to see in the next post.) I could have shortened the armhole, but I didn't - after all, a cardigan should fit over a variety of tops, right? Not just skinny-sleeved t-shirts. Classes are filling up. I just taught the t-shirt class last Friday night. These patterns are so easy. The fitting is easy. Every student that I've had in these classes goes away happy. Thank-you Pamela!